The Chateau is nestled in the small village of Lancie, located south east of Fleurie and Chiroubles, in the northern part of the Beaujolais appellation where some of the best soils and terroirs lay on gentle slopes of the rolling hills of the land of the "Crus". Chateau du Chatelard has a long established wine reputation and history. The Chateau, rebuilt in the XVIIIth century after being destroyed during the French Revolution, now belongs to Sylvain and Isabelle Rosier. This young couple is passionate about wine and terroir, making beautifully crafted Beaujolais with old vines, some were planted around 1955, under sustainable and Biodynamic culture: no herbicide, respect of the biological life of the soil, short pruning on accordance to the moon, working the soil, leaving the grass and maximum foliage completed by selected hand harvest at full maturity, to obtain the best, healthy grapes. The resulting wines are great, balanced, fruity and gentle, yet rich and complex without being too opulent. 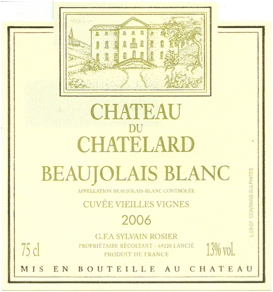 Boasting aromas of green apple, white fruit and lemon zest minerals on the nose, their 2007 Chateau du Chatelard Beaujolais Blanc is soft and plump, somewhat elegant, creamy and bright in the same time. The palate reveals pear, golden apple flavors with great acidity and refreshing, round finish.